музыкальный редактор-секвенсор для написания музыки. FL Studio Producer Edition - Главная составляющая проекта композиции - генератор. Генератор синтезирует или воспроизводит звук. Генераторов в проекте композиции может быть неограниченное количество. Каждый генератор обладает своими уникальными настройками, уникальным звуком. Для генераторов программируются нотные партитуры. Партитуры в FLStudio имеют конечную длину. Кусочки партитур (паттерны) складываются в последовательности (располагаются в нужном порядке в списке воспроизведения). Звук каждого генератора может быть обработан при помощи множества подключаемых эффектов. 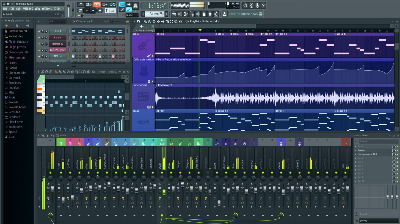 FL Studio 20 is a complete software music production environment or Digital Audio Workstation (DAW). Representing more than 18 years of innovative developments it has everything you need in one package to compose, arrange, record, edit, mix and master professional quality music. FL Studio is now one of the world’s most popular DAWs and is used by the most creative artists. Buying FL Studio not only gets you the latest version but all future FL Studio 20 updates free. We believe you should have the functionality you paid for, bug-fixed, developed and updated for as long as we develop FL Studio. This has been our promise for 18 years and counting. Популярный редактор-секвенсор для написания музыки. Музыка создаётся путём записи и сведения аудио или MIDI материала. Готовая композиция может быть записана в файл с расширением WAV или MP3, который может быть прослушан в большинстве медиа-проигрывателей. Данная программа является звуковым редактором. Со времён её первого издания претерпела значительные улучшения и изменения, которые способствовали грандиозному успеху FL Studio. В программе содержится более 3900 звуковых эффектов, которые помогают, как сочинять, так и редактировать музыку. Несомненным достоинством программы является её простота и доступность для любого начинающего музыканта. This release contains all internal FL plugins. For VST version, checkout our another releaese. - Playlist Track Mode - Organize projects and speed workflow by grouping a Channel Instrument, Playlist Track and Mixer track. Changes to the name, color and or icon of any member in the group will ripple throughout the chain. Alternatively, drop instrument and effect plugins or audio files on Playlist Track headers. - Tools > Macros > Reset empty playlist tracks - Reset all unused Playlist tracks to default color, icons and name. - Improved Audio Recording - Link Playlist Tracks to Mixer Tracks and their input, so audio is recorded to the selected Playlist Track Track. Follow-up recordings are added as sub-tracks of the parent Playlist Track. Armed Input Mixer Tracks now show orange faders to better display their state. Pre/Post Effects Recording - Click the Input Menu icon to choose Pre/Post FX recording. - Stepsequencer Channel Looping - Channels in the same Pattern, with shorter lengths, will loop to make up the difference. This restores looping behavior from FL Studio 11, and includes new advanced options, to allow control of per-Pattern, per-Channel looping and loop-length for polyrhythmic patterns. - Stepsequencer - The maximum step-count has been increased from 64 to 512. - Channel Rack Menu > Set swingmix - Set the Swing Mix control values simultaneously for the selected Channels. - Show complete piano roll preview - Channel Rack menu option to show all the notes in patterns, rather than just the number of bars visible in the Stepsequencer. - Channel Rack Close icon - Can also be closed with the (Esc) key. - Sampler Channels - The 'Time' knob is now automatable when the 'Mode' is set to a realtime algorithm (Resample or Stretch). - General Settings - New 'Check for updates' option at startup. - Mono export - Mono audio file export. - CPU & Memory Panel - 'View FPS' shows the FL Studio GUI frame-rate. - Project Information - Extended project statistics (bottom of panel). - 55 x "Minimal Kick" Samples - Browser > Packs > Drums > Kicks > Minimal Kick 01 to 55. - ZGameEditor Visualizer - Video export wizard (beta). - Akai FL Studio FIRE - Stepsequencer-looping workflow enhancements (Set Channel loop-length & burn to Pattern).